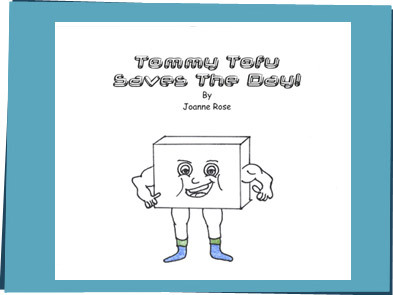 Last time we met Tommy Tofu, star of a kids' book. Today we're hanging out with Joanne Rose, the author of the book, and a serious vegan! Vegan means she eats only plant products and nothing that comes from animals. So what's it like being vegan, and why did you become one? Being a vegan is a healthy, cruelty free and environmentally friendly lifestyle. I became vegan because of my love for animals. I was always an animal lover but wasn't conscious of what I was eating until my late teens. I then made the decision to go vegan. We're always looking for more ways to be AGAP (as green as possible). How does being a vegan help us be green? Veganism and being green are both about conscious living. That means knowing what we're using and where it comes from. We care for the animals and the planet. We think it's so cool that you wrote a book for little kids. What made you decide to write it about tofu? With soy being a really important part of the vegan lifestyle and a very healthy and versatile substitute, I felt it was important for kids to know about tofu as an alternative and learn more about healthy and conscious living. The idea of creating a fun character came to me two years ago. I totally get that. I wish all my food could talk. So what's your favorite food? Is it tofu? I love Thai coconuts as a snack. I love big healthy salads with avocado and walnuts and tahini (sesame seed paste) dressing. I also enjoy steamed vegetable dishes with marinated tofu. Mmm, I've never had Thai coconuts, and I'm not sure about tahini, but they sound great! We're always on the lookout for new foods to experiment with. Right, Dex? Um, Dex? Hey, get out of her purse! She doesn't keep the coconuts in there!